Humaita, a tiny town in the heart of Amazonia. A single inhabitant per square kilometer and no less than six bus companies. The most famous is the Empress “Siquiera”, run by Luis and his son, Leandro. 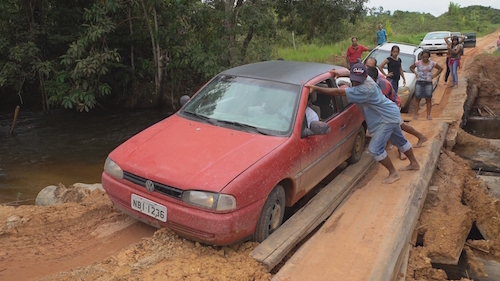 They are the only ones who dare venture onto the National 319, the worst road in Brazil. They could give up, but they are both stubborn. They feel they’ve been given a mission since the other companies threw in the towel when confronted by the difficulties of the route. They are the only ones who still risk taking the 319 at this time of the year. An abandoned road, but one that they, through sheer will power, decided to reopen. It drives deep into the heart of the Amazonian forest and, though superhuman efforts, these indomitables overcome every obstacle that looms up in their path. The drivers who traval this national highway all ask themselves what they did to deserve such punishment. For them, the road has many names: “green hell”, “purgatory” and “road of pain”. In normal weather, when the road is dry, the bus completes the trip in 18 hours, but during the rainy season, it takes 6 times as long. During this period, more than two meters of rain can fall. Water courses overflow and entire sections of the road disappear under the waters.